Xmark Adjustable XM-7630 Bench – Sturdy and Solid! This adjustable weight bench is a great upgrade or first purchase based on the price and the quality of the bench. The best feature right off the bat is that you can use this bench for not only incline exercises and DECLINE! This adjustable bench is what you would expect to see in a gym. It has 7 adjustable back rest angles, 3 seat adjustments, decline, sturdy as heck and has a weight capacity of 1500lbs! I’ll get straight to the point. The Xmark 7630 weight bench has 7 back rest adjustments, 3 seat angle adjustments, really solid frame construction and wheels to transport it. 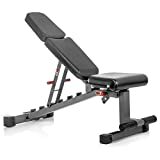 This is a very reliable and trusted bench for weight training at home or a professional gym. It’s has a wide range of positions and the materials are excellent quality. So, let’s get underway and have a closer look. What a versatile weight bench. With seven different adjustment angles from decline right up to military, you’ll be well equipped for all your weight training exercises to keep you challenged and get results. The angles are -20, 0, 35, 50, 65, 85. The seat cushion is ergonomically designed and has three positions with pop-pin adjustments, to ensure you have the greatest comfort and support during your training session. The assembled dimensions of this bench are 52.5” x 22.5” x 50.5”. When flat the bench height is 19.5”. The seat cushion is 16” by 16” and the back cushion is 33.5” by 11.5” so you’ll find yourself with plenty of padding. It also has a massive weight capacity of 1500lbs so this is one heck of a heavy-duty bench and perfect for anyone serious about strength lifting. The bench itself weighs 64lbs. In a Hurry? >> View best prices on amazon… and get your bench asap!. The frame is of commercial grade construction, made out of 11 gauge 2” by 3” steel so you won’t have to worry about whether the bench is sturdy enough. The steel is baked powder coated so it’s scratch resistant and protected against rust. The backrest and seat cushions are double-stitched Duraguard vinyl. That means it will be darn near tear resistance. They’re ultra thick at three inches and it’s sweat and tear resistant so will last a lifetime. What more can you ask for? You can be rest assured you’ll be comfortable and supported with this durable padding – especially as the seat is ergonomically designed for maximum productivity and to reduce discomfort and fatigue. The bench has an attached bar at the bottom to hold down your feet – you hook your feet underneath to keep you stable and your body in the right position while lifting – ideal for exercises such as power sit-ups. There are built-in transport wheels and you can lift the bench up by the foot bar to easily wheel in and out of place. The feet are bolted on and are skid-resistant so you can be confident of your safety with whatever weight you’re lifting. You’ll need to assemble the bench yourself but it comes with a few handy tools to help you out. It also comes with a bit of touch-up paint in case you need to give it a quick revamp at any point to keep it looking brand new. A guaranteed lifetime in-home warranty. To be honest it’s hard to fault this bench. If you want to get super pedantic you could argue that it’s a bit bulky and heavy, or more pricey than other benches at $389 but really you want a sturdy bench so who cares. The only other thing is that there’s no specific handle but the fact there’s a foot lock means you can pick it up from that and wheel it around. I’m struggling to find anything negative about this bench, as it’s such a well-constructed piece of gym equipment. You might not have the color-customization such as the likes of the Legend Three-Way but who needs color when you have all the other features? There were numerous comments from recent purchases that said there were not enough washers to secure the seat which causes a bit of wobble. So, you will need to pick up 2 more of your own washers. They are 3/8″. This is a perfect bench if you’re lifting heavy weights as it has such a high weight capacity of 1500lbs. It’s sturdy, solid and heavy duty and the makers are so confident of its quality that it has a lifetime in-home warranty. It would be perfect for your home gym but as the materials are commercial quality, it can also be used for light institutional use. With seven different angles you’ll have no problem with any plateaus – there’s enough variety to keep any workout challenging, especially with the decline angle of -20 degrees. Yes it costs a bit more than some other benches, but you’ll get what you pay for – and in this case you’ll get a quality, reliable bench, which means business.